How to use the speed of sound calculator? 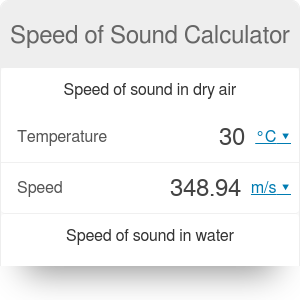 This speed of sound calculator determines the speed of sound in the air and water. Not everybody knows about the sound speed dependence on the temperature - the higher temperature of the air is, the faster the sound can propagate. To calculate the speed of sound in water, just choose the temperature - in Fahrenheit °F or Celsius °C. You can also choose the desired unit - with this tool, you can find the speed of sound in mph, ft/s, or even knots! Did you notice something interesting? The speed of sound in the gas depends only on two constants - γ, R - and on the temperature but not on the air pressure or density as it is sometimes claimed. The humidity of air has also effect on the speed of sound, but the influence is so small that it can be neglected. The temperature is the only important factor! The most often used value is 1482 m/s (for 20°C); however, an easy formula for the speed of sound in water doesn't exist. Many authors derived equations from experimental data, but the equations are complicated and they always contain higher order polynomials and plenty of coefficients. The data in our calculator for speed in water comes from the speed of sound in water charts. The speed of sound in water is an important parameter in sonar research and acoustical oceanography. Nevertheless, the formula for seawater is even more complex as the speed of sound is also changing with the salinity. Let's calculate how the sound propagates in cold water - like really cold, from wintering swimming activities. Choose the section you need - the speed of sound in water or air. It's water in our case, so the bottom part of the calculator will be used. Pick the temperature unit. Let's take degree Fahrenheit. Select the temperature from a drop-down list. Take this freezingly cold 40 °F. The speed of sound calculator displays a speed of sound in water, It's 4672 ft/s. Let's compare it with 90 °F, the warm bath temperature. The speed is equal to 4960 ft/s this time. Remember that you always can change the units of speed of sound: mph, ft/s, m/s, km/h, even to knots if you wish to. Now, as you know the speed, calculate the time or distance with this speed calculator. Also, you can check how far the storm is with our lightning distance calculator- the speed of sound in air is a significant factor for that calculations. Speed of Sound Calculator can be embedded on your website to enrich the content you wrote and make it easier for your visitors to understand your message.